Matching pair of fun and festive Disney cookie trays. The deep round Christmas trays are perfect for stacking yummy Christmas goodies such as mince pies, mini sausage roles, cookies and cakes! Each tin cookie tray shows fun Christmas scene of Winnie and friends at Hundred Acre Wood. One shows a snowy scene of Winnie wrapping a gift, Tigger in a muddle and Piglet with a stocking almost as large as him! 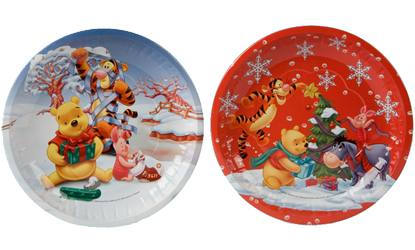 The other Christmas tray shows Winnie, Eeyore, Tigger and Piglet decorating a Christmas tree together. These two lovely Disney Christmas trays would make a great addition to your festive preparations!